Available in half, third, or full sizes, these aluminum steam table pans feature curled rims to prevent spills while in transport. 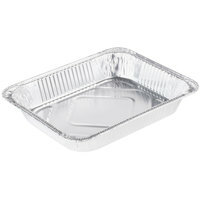 They're also oven safe, and some have compatible lids, allowing them to be stacked and stored before you serve them. You can also take them straight out of the oven and place them into a chafing dish for an easy and convenient way to bake and serve food all in the same pan. Also make sure to check out other great items from Choice, D&W Fine Pack, Durable Packaging and Western Plastics. 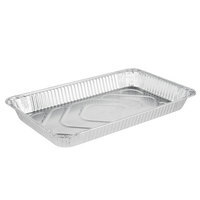 Aluminum steam table pans are great for remote catered events since they’re both durable and disposable! Just throw them away at the end of your event without any messy clean-up or heavy pans to bring back with you. Choose from different sizes to accommodate the dishes you're serving. We also offer compatible lids so you can take leftovers home when the party is over. Check out other great pans to include with your catering supplies such as aluminum foil roast pans for roasting meats and fish as well as dessert pans like aluminum foil cake pans and aluminum foil muffin pans. If you're wondering where to buy western plastics aluminum foil steam table pans & lids, we have a large selection of western plastics aluminum foil steam table pans & lids for sale at the lowest prices.